by Emma | Dec 23, 2018 | books, environment, What can I do? is running a fever, and we need some wind-turbine ibuprofen to bring down the heat. Or maybe it’s a sinking boat, and instead of scooping water out, our crew needs to patch the hole where it’s rushing in. Which strike me as very twee. I would feel like an idiot trying to convince my carbon-spendthrift parents that they should support wind farm ‘ibuprofen’. Having given it considerably thought, I have decided that (despite the fact I am a pacifist), I disagree – the fight for the planet is a war, and should feel free to say so. Wars kill people; climate change is killing people, and the steady trickle of deaths will become a massacre if we sit back and don’t intervene. Klein agrees. 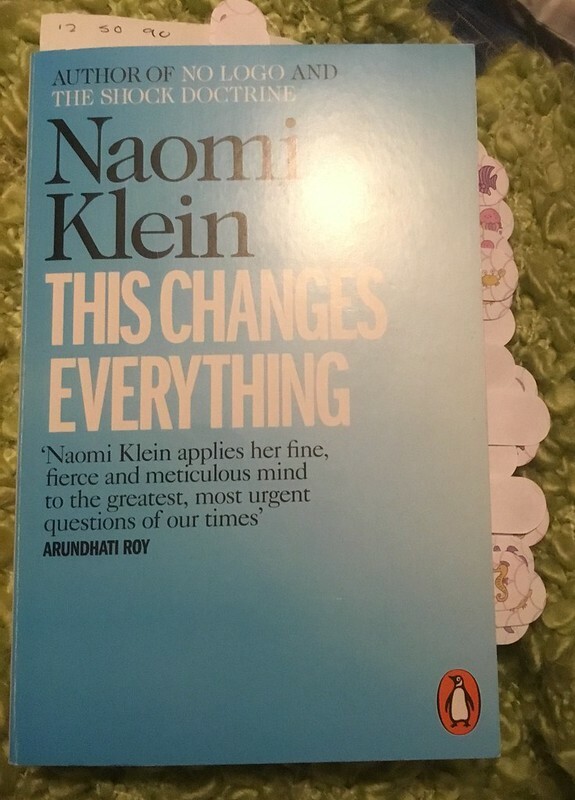 In the Introduction to her book, she explores some of the explanations that have been put forward as to why humanity has done so little to combat climate change that we are in a worse position (with carbon emissions) than we were when we first seriously started discussing it, way back in 1988. She throws them all out, and proposes her own reason – the climate change crisis has unfolded in an era when the political class has been moving us relentlessly into ‘extractivism’. First materialism, and then increasingly unfettered globalisation have moved us in entirely the wrong direction. To combat climate change we need stronger, bigger governments, committed to public infrastructure (such as mass transit) and providing disincentives to polluting industries and incentives to sustainable ones. Our political systems, all over the world, have instead been moving towards privatisation, deregulation and shrinking taxation. This would, we were told, fuel economic growth, which would trickle down to the rest of us. I think we all now realise this isn’t true, but we’re still being told that the alternatives would be expensive and would ruin great swathes of the economy, but the economy isn’t working for great swathes of people anyway. We are told to wait for some mythical ‘technological fix’ that will mean we can carry on without making any changes, but we have plenty of solutions, technological or otherwise, that work, and have been proven to work, and could be implemented now if there was political will. By posing climate change as a battle between capitalism and the planet, I am not saying anything that we don’t already know. The battle is already under way, but capitalism is winning hands down. It wins every time the need for economic growth is used as the excuse for putting off climate action yet again, or for breaking emission reduction commitments already made. I’m sure that you have already made the link between capitalism/globalisation/consumerism (whatever you want to call it) and environmental degradation, and have been working towards reducing your impact for many years. What’s different now is that we’re running out of time. We recently watched as the UN Climate Change talks in Poland came to an end, banging out an agreement by tabling some of the trickier motions. Apparently the deal agrees how the 2015 Paris agreement will be put into action; of course, the US pulled out of being a signatory to the Paris agreement in 2017. There’s a four-year withdrawal process, though, so they still get invited to the meetings. The Guardian has an interactive guide to the the human cost of 2018’s climate disasters. Scientists warn that the effect of tipping points is going to be greater than originally thought, as they’re going to knock into each other like tumbling dominoes. The IPCC says we have 12 years to limit the climate catastrophe. Klein speaks to the need for a new vision for civilisation, an idea of something we are moving towards, rather than the things we will have to give up to get there. That’s what’s going to come out, I hope, in the rest of the book. Klein ends the Introduction with one of the reasons that climate change has finally made it onto her radar. Why she has, in her words, stopped ‘looking away’ from a problem she knew was there. While she was doing her research, she was reading bedtime stories to her young son. One of his favourites was Looking for a moose, but by then extraction of tar sands in nothern Alberta has begun to poison the landscape, and hence the moose, and they were disappearing. She realised her son may never see a moose. The same was true of the bats that were his favourite characters in Snuggle Wuggle. During a record-breaking heatwave in Queensland, 100,000 dead and dying bats rained from the sky. If humans were looking out for canaries in the coalmine, those would be good examples, although not the first. The coral reefs spring to mind, and the bees, and the polar bears running out of ice in the Arctic. But we’re not looking, or we’re still looking away. There is some hope, I think, in the way that plastic pollution has recently reached (finally!) the public consciousness, and caused mass demands to do something about it. That needs to be a wake-up call that makes people look more widely at the planetary emergency we have created, rather than a distraction from it. It would be easy to spend all our time protesting about plastic pollution, whilst still looking away from climate change. Seriously considering a period when I buy nothing new. Wondering what would be my downfall. Books are the obvious choice, but I have shelves of unread ones…. Since 10th December I have been making a conscious effort to buy less stuff. Not including essentials (food, toiletries etc. ), I have bought two things. The first was a copy of the Songhive CD, a collection of folk songs about the plight of the bees. I love the idea of activism via folk music, so I thought it would be worth supporting. The second was a proper ceramic pudding basin, for the making of steamed puddings. My exploration of WW2 era cooking has got to the point where not owning a pudding basin was going to be a handicap. Rather than ‘click click’ and have it delivered, I waited and bought it in an independent farm shop, which we dropped into on the way home from somewhere else. It’s a Mason Cash, and touts itself as a British brand, but with globalisation who knows what that means any more? The website says the bowls are designed in the UK, which almost certainly means they’re not made here any more. Mason Cash is now part of The Rayware Group, “a family of vibrant British brands” that also includes Kilner. You’d have to be an investigative journalist to decrypt corporate relationships these days.